The Hive has died. The colony fought. All winter it held on for dear life. Come spring it became weaker and weaker. Three weeks ago I gave it a new queen in hopes that she could turn the colony around. There were not enough honeybees left to sustain the colony. There were eight bees left last night and none this morning. The colony is dead. We can blame Monsanto, the manufacturer of genetically modified crops, pesticides and herbicides such as Round Up all we want for the destruction of the honeybee. But in truth we only have ourselves to blame. WE are to blame for it all! Our need for GREEN luscious lawns killing that which sustain more life than we can fathom is only one factor. We need to blame ourselves for our greed for bigger more profitable vegetables and fruits that are produced all year long regardless of their natural seasonal cycle of development. The agricultural industry needs the livestock to produce more for their own profit and our own unquenchable sense of want. We WANT more milk, more meat so they are given stimulants and antibiotics to support our fear of lack which only supports THEIR (agriculture and Monsanto’s) profits. Greed fed by fear is what we, the consumers, have become. For it is the consumer that chooses to kill the flowering plant that WE call weeds. It is the consumer that supports the industry that manufactures the poison directly or indirectly. It is the consumer that buys the by-products from the agricultural industries who uses those products to increase their supply while harming the creatures that support us. Because of OUR demands WE are supporting the harm. We have only ourselves to blame for it all. When, if at all, will this end? Will we destroy the Great Mother Earth before we realize what we are doing? When will we finally listen to the delicate, gentle creature that has so much to teach about life, community, cooperation and the interdependent web of life – The Honeybee? She’s IS the VOICE that sustains life. When will we hear her? I am sorry to hear that Barb; some very good points in this blog. What the heck are we doing to ourselves???? Let’s go back to the days of dandelions and clover in our lawns and tryng NOT to step on a bee. Totally Sharlene. Very good recipes for dandilion leaves and clover flowers too! So sorry to hear your news this morning when I awoke :( I couldn’t agree with you more, people need to be more aware and think about how what they’re doing (and what they’re wanting, instead of needing) affects our delicate ecological balance. I welcome dandelions and other wildflowers in my garden, which used to be 2 acres of pristine lawn when I purchased the place, which I have been naturalizing into a (poison-free!) woodland meadow as my own small haven for honey bees and other pollinators and insects. Thank you Elise. I was very surprised how deeply it affected me. I have a new soapbox to stand upon now….pesticide,herbicide,GM free! But the good news is that I did rescue a honeybee swarm three weeks ago and they are doing just wonderfully! We have so much to learn from the Honeybee. I just saw this about the bee colony and was so sad, but then HAPPY as I saw you rescued a new colony. Great GREAT news. Please post some new pictures. Keep up the good work! but as I write more on the musing of the hive, I will be sharing actual photos of my own girls. I have two hives now, one that I’m nursing along and the other (the first swarm) is growing nice and strong and making honey. 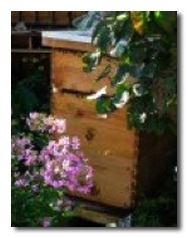 Beekeeping is a very emotionally risky hobby but the heart needs this excercise to fully grow. Keep following, more to come! Thank you for your support!